Sorour Ekhtiari Amiri developed an interest in machine learning during her senior year of college. 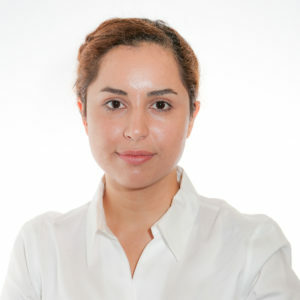 After earning a bachelor’s degree in computer engineering from Beheshti University, she worked on machine learning applications while getting a master’s in computer engineering at the University of Tehran. Amiri then decided to pursue a Ph.D. in computer science. Amiri’s research is focused on summarizing large graphs and graph sequences based on a given task. She targets the task-based graph summarization problem, looks at various types of graphs, and uses deterministic and learning based approaches to generate high-quality graph summaries. “Large graphs — also referred to as network — appear everywhere, as they very well capture the relation between objects,” Amiri said. “For example, social networks, co-purchased product networks, people contact networks, and protein interaction graphs are instances of large graphs in the real world. Analyzing these graphs and solving various tasks on them has many applications in different fields such as cybersecurity, recommendation systems, sociology, and biology. However, the increasingly large size of such networks makes it challenging to visualize and analyze them, highlight their important characteristics, and perform fast computations on them,” said Amiri, whose DAC faculty advisor is B. Aditya Prakash. Results of her research while a DAC student have been presented at a number of national and international conferences, including the IEEE International Conference on Data Mining series (ICDM); European Conference on Machine Learning and Principles and Practice of Knowledge Discovery in Databases (PKDD); and the Association for the Advancement of Artificial Intelligence (AAAI) conference. Her work has also appeared in journals such as the IEEE Transactions on Knowledge and Data Engineering (TDKE) and Data Mining and Knowledge Discovery (DAMI). Amiri spent this past summer as an intern with Google’s “search ad” team, developing and training machine learning models and generating a new signal for using in search ads auction. She also analyzed machine learning models and other search ads signals.